OGLE-2005-BLG-390 was detected by the OGLE EWS [opens in new window] System on July 11, 2005. True-colour image of the OGLE-2005-BLG-390 field (as observed by the PLANET team with the Danish 1.54m telescope). The event resembled the typcal single lens light curve for most of its duration. But for a period of about a few hours on the night of August 10, 2005 the gravitational field of the planet caused a short-lived planetary deviation lasting several hours. It was noticed first by the PLANET team. Observations of the beginning of the deviation were taken from Chile by PLANET and OGLE, while the second part of the deviation was well covered by the PLANET observing station in Perth, Australia. The MOA collaboration also secured images of the microlens when testing its new telescope and confirmed the observed anomaly. 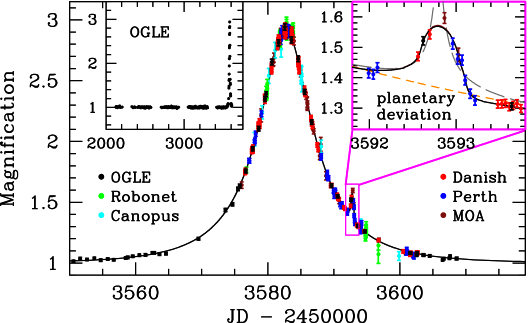 Modeling of the light curve indicates that the deviation in the light curve of OGLE-2005-BLG-390 is caused by a record small mass planet. The new planetary system is also the most distant among all known extrasolar planetary system. (regularly updated when additional observations of the lens field are collected) are available from the OGLE-2005-BLG-390 EVENT PAGE [opens in new window]. PLANET team WWW pages [opens in new window].